Inside i saw no differences: about 36mm in diameter in both cases. As the movements also have same measure (24mm), both spacers are equal. I have an hypothesis. As experienced with the white RR, the dial on those new cases (420) is partially covered by the edge of the case, while on older models (020?) the dial is totally visible and it's totally "inside" the internal circumference of the case (then also closer to the crystal). I wonder if the size difference in the central section of the case is related with those differences of construction. Just after identifying the Komandirskie 39x (thanks Stefano and NHT) there are two more variants: one is like the opposite of 39x with regards to the right hand edges, with more pronounced curves. This type is still offered new and with 2409 movement. Another type is oval shape but asymmetrical. However, the one in that old thread has a normal black bezel. Don't know if it's original (that USSR-made dial was often offered with black bezel on octagonal models, maybe it's original), or if it's a Franken. The caseback is typical of post-Soviet Komandirskie. Oh, and there is the one with crown at 4 'o clock - i have three of them. Thanks Michele for adding more for me to consider! 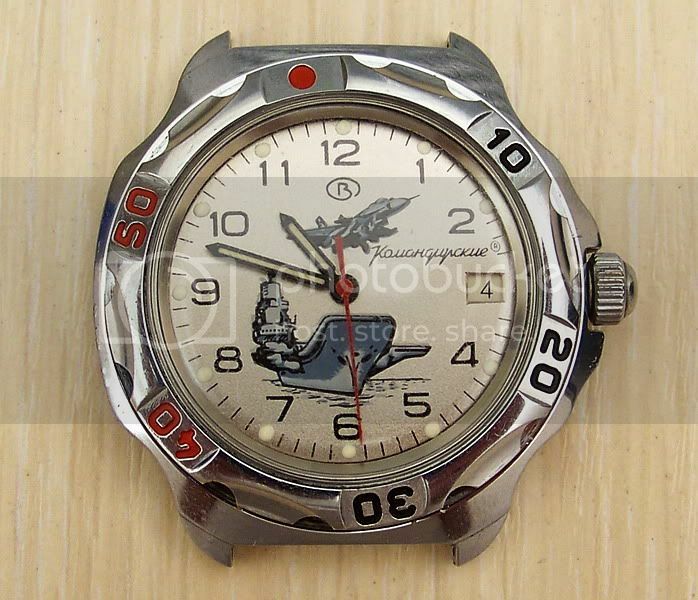 Appears to be a regular round case Komandirskie with Black Diver dial and regular hands, along with an unusual bezel. The case appears very dark, could either be the lack of reflection, or black finish. I do not feel that black-finished cases have been made extensively, if at all. 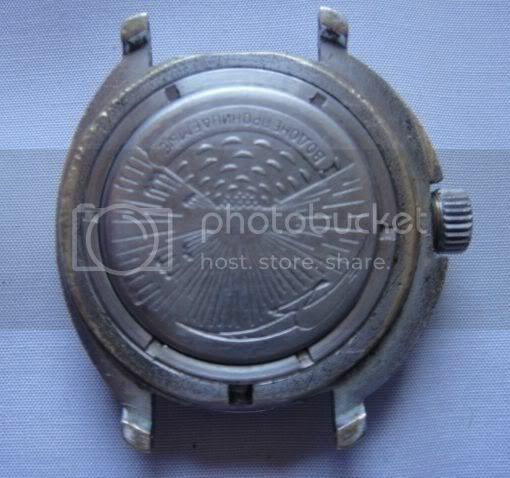 That is the same oval asymmetrical case I posted earlier; the eBay seller's pictures show chrome layer wear showing it is a Komandirskie case, but these pictures show an example fitted as an Amphibia but with a flat Komandirskie back, which should not accommodate an antimagnetic shield. 4 o'clock crown case: I do not think I have seen an example with the familiar type of rotating bezel. Perhaps it was never intended to have a rotating bezel, thus not within the field of investigation here? This is the large round Amphibia case, scarce but examples are indeed known. 3 o'clock crown pillow, more scarce than the 2 o'clock one but now well documented. Type 350 Amphibia case with swivel lugs. This I believe is the Type 350 Amphibia case with the pressed metal lugs replaced by thick wires. I am not sure if this warrants a new classification type, unless there's a different official appellation given to it. Mark Gordon's 1298 shows an example with the usual pressed metal lugs, but instead of rivets, wires with end loops were used instead, looking almost like a backyard fix. No problem! The pics are mostly from Ebay auctions that took place from 2002 to 2006, but i have stored many pics in the following years too. So i must browse my pics folder to check if there is some other thing. I don't know if it's a reflection or a real black case, anyway that bezel is very rare. Seen just three or four times, one recently. 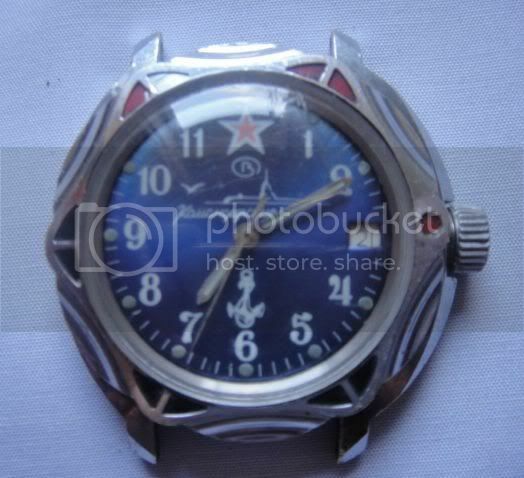 "Unusual" case coatings were not a Vostok's habit until some years ago. 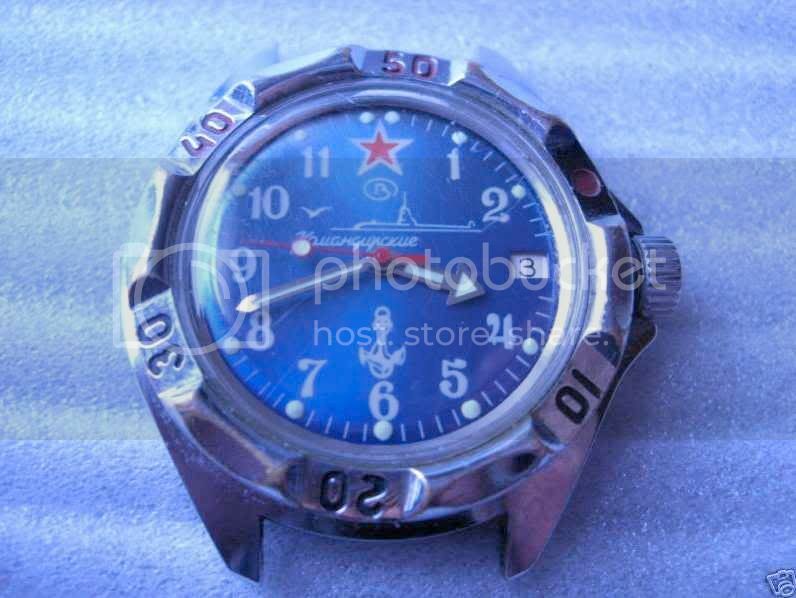 There is a example of white-dial Vostok with big sailboat on the dial, and semi-transparent blue coating on the case (sort of anodyzed treatment). Dial and caseback seems in common with the watch that i have called "Komamphibia" some time ago (BTW, did you add that case too?). Don't know if the bezel is fixed or not. I have this black one (in better conditions though, almost new, except a scratch on the case), and a NOS one with white dial, box and paper. If the paper is matching, it may be useful. I will check it today. No external bezel was mounted. The internal fixed bezel was always black. I have also a third one, found at the flea market, it was "frankened" with an U-boot dial. 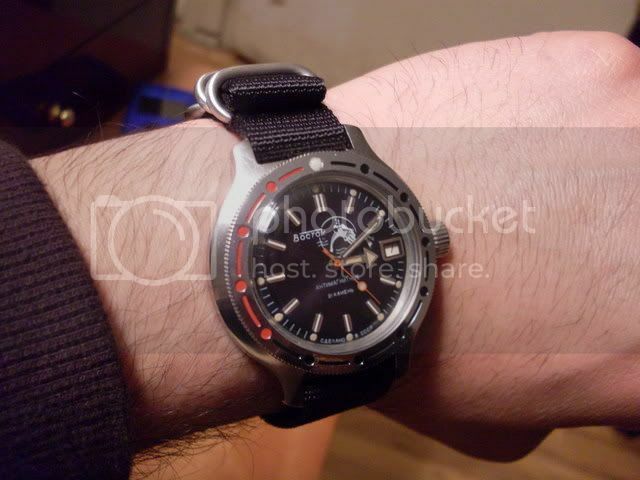 The front view was so destroyed by the rust, and the watch so messed up anyway, that i have fitted a Raketa bezel on it! I have one, "rare but not so rare" - it can be found with a bit of effort. Not an everyday find anyway - more an "everymonth" find. There was an identical U-boot version for sale with this, watches were new, so it should be original. 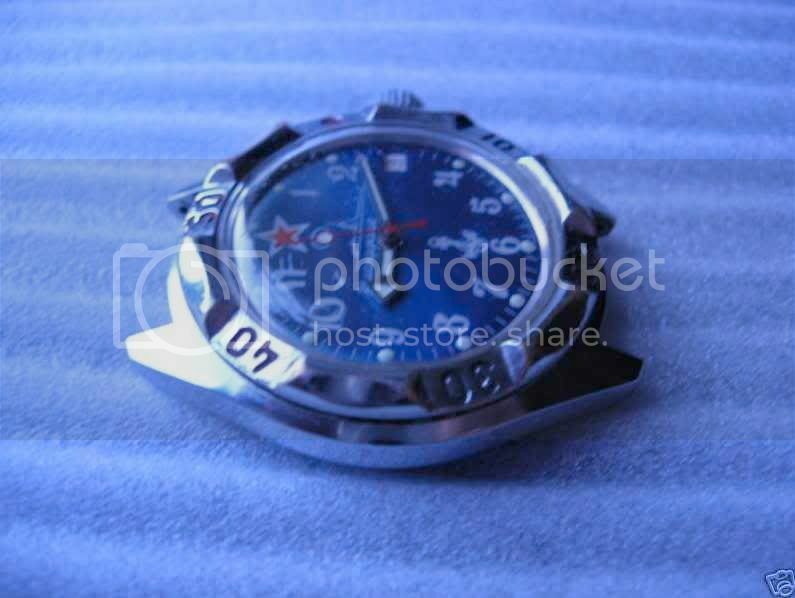 Caseback was the same of the watch in pictures 2/3. 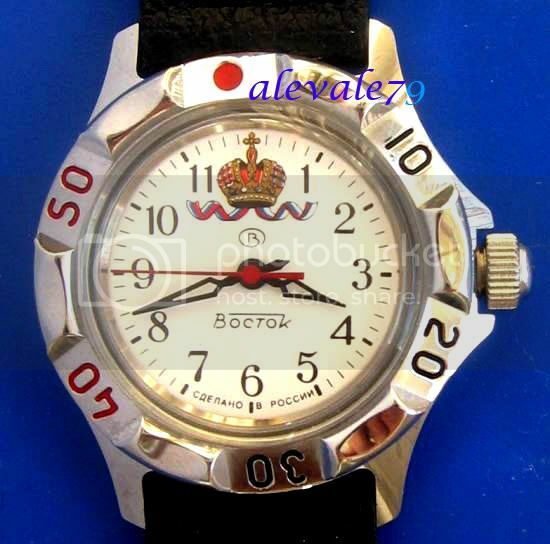 I remember that somebody (lot of years ago) reported this watch as used in Kosovo by Russian troops. Of course, as i have already said in the past, that's a totally uncontrolled rumour with no sources. Interesting case though. discussed many times, seen in several configurations. Shape of these lugs indicates a professional production IMO. I have seen another one like this, if i'm not wrong. Probably the watch owned by Mark is fixed with home-made bent wires, probably to make it more resistant. But it's just my theory. Last edited by michele; July 26th, 2010 at 10:25. Thank you for the additional information, much appreciated! Supposing it was an Komandirskie brass case but in black finish, and produced in any appreciable number as products for general sales, Vostok would have assigned a new third digit to its type number. It could also be a custom piece though: the owner's brother-in-law could have owned a PVD company! I have to admit that I am getting quite confused by the round cases, both Amphibia and Komandirskie! I'd await more experienced members to help with that. I am suspecting this as a Frankenwatch, and even possibly a "factory Frankenwatch" built as a styling exercise using existing parts, and somehow managed to leave the factory. The rarity of this asymmetrical case might suggest that it's experimental and existing parts built before dissolution were used, such as dials. We are speculating of course, but it sounds plausible nonethtless. Thanks for offering to check the paper that came with the white dial version. If the external bezel was put into place using the same wire mechanism as the familiar types then it would be within the scope of this investigation. I have decided to consider this as one of the variants of the Type 350 case. Of course, one of the back room boys at Chistopol might present us with a complete list which solves all our questions! watches are meant to tell times.. I asked the vendor of this watch which is NOS with box and paper, thus expected to be original, about the type number and he said it's 091xxx. I do believe it is a "non-star" Generalskie case but the watch was built up during the chaotic post-dissolution period, hence the strange use of Amphibia hands. If it is indeed a Generalskie, then we have just found its case type number. I think time is ripe for me to show the Amphibia section, as it stands now. As an introduction, I would like to say that this is an ongoing project, as an attempt to identify and classify the case types used in the very popular Amphibia and Komandirskie watches by Vostok, with attached - and almost invariably revolving bezels. Due to the interchangeability of parts, trying to identify an example of a watch based on dial markings would be fraught with danger, as mis-identification can be common. Hopefully it also goes some way to serve a second purpose, as an aid to identify spurious examples not put together at the factory. Amphibia models are with a stainless steel case, and in Vostok's six-digit code, the third digit being "0" signifies that, and the first two digits signify the actual design of the case. For illustrations I will try to use Phil's pictures as far as I can. Additional notes in italics are more or less "points to investigate further" and I would greatly appreciate any help from fellow members. Note: Although the Maiers' page shows one with flat-ended Amphibia crown, it has date (presumably 2214 movement) and regular Amphibia hands. Those shown by Phil have dome-tipped crowns and earlier forms of hands, including one with paddle hands. Mark Gordon's 0662 also shows dome-tipped crown, but with unusual combination of hands and a Komandirskie-signed dial with date, powered by a 2214 movement. An example was used by Yuri Viktorovitch Romanenko in the Soyuz 38 space mission, September 1980. Additional variants are documented with wire loops instead of the pressed metal lugs, and with rivets replaced by pieces of wire. Note: Mark Gordon's 1195 is fitted with a Komandirskie MOD dial with date and powered by a 2234 movement. Robert Prochowicz's 3037 appears to have a 2414 movement and Komandirskie hands, which may or may not be original. 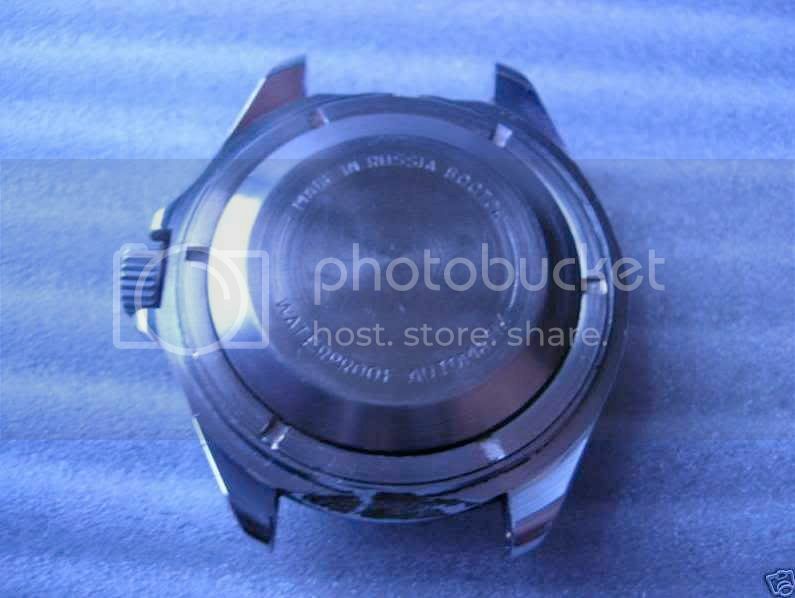 Most, if not all of them are equipped with a soft metal antimagnetic shield covering the back of the movement. Examples have been documented with polished or brushed finish on the case. *It is possible that both Mark Gordon's 1195 and Robert Prochowicz's 3037 are spurious pieces, need to look into them. Note: the three verified examples, produced in 1981 and 1986, show different type numbers, as 1190 and 630 respectively. Lug width is 22mm. Note: Originally a variant of the Amphibia case with a slightly oval shape, it is not yet known if the type number 930 was assigned at the time. First made with brushed finish and a variety of dials. Most are with 21-jewel automatic movements with date, Mark Gordon's 0280 is powered by a 2409, however. Later on, this case, with confirmed appellation of Type 930, was used in the Neptune series with a distinctive dial design, polished finish, and equipped with 31-jewel version of the automatic movement. Note: the thinner case body can take only the 2409 hand-wind movement, with a slightly domed case back. Middle section of the case is 2mm thick. 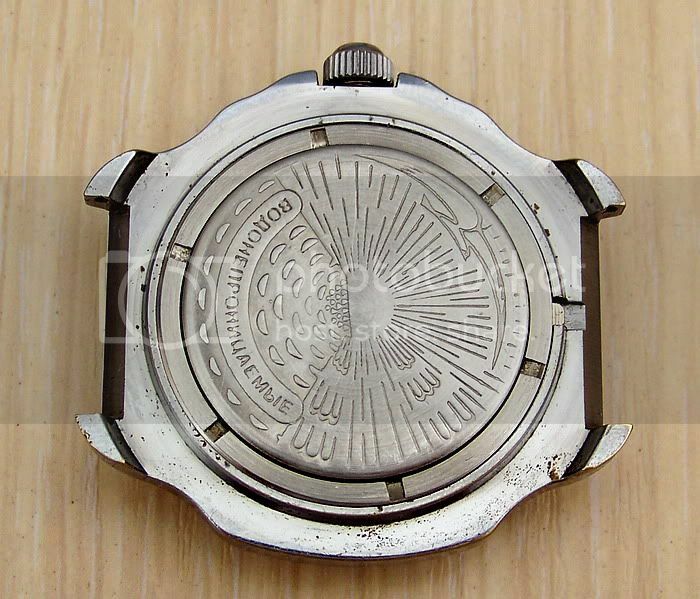 Note: the Type 420 case can be considered as a development of the Type 020 case, the only difference is that it is slightly thicker, at 3mm, to accommodate the 2414 automatic movement, as seen in this picture by NHT. Its case back has a more pronounced dome. *More information would be needed for both Type 020 and Type 420 cases, and the two possible versions of the latter. Note: When seen from the front, the case perimeter extends well beyond the bezel. *Still need to find period of production for each type, and confirm movements(s) used. Last edited by Seele; July 28th, 2010 at 19:57. - As you can see, confirm 091 code for non-star Generalskie type case. And Thanks for this great job !